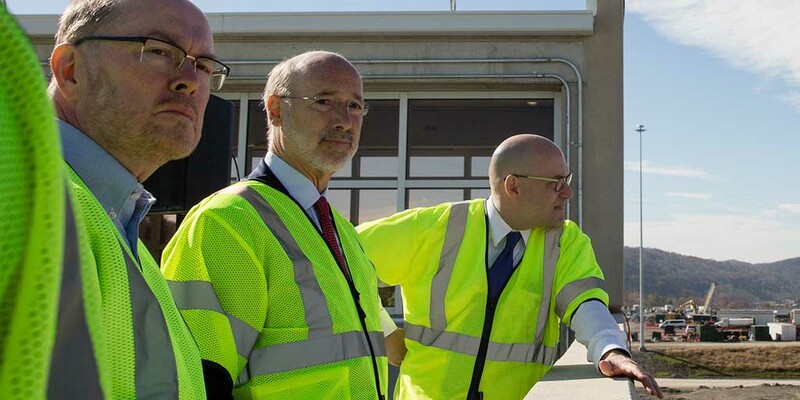 Harrisburg, PA – Governor Tom Wolf today announced the investment of $69 million for 20 drinking water, wastewater, storm water, and non-point source projects across 14 counties through the Pennsylvania Infrastructure Investment Authority (PENNVEST). The funding for these projects originates from a combination of state funds approved by voters, Growing Greener, Marcellus Legacy funds, federal grants to PENNVEST from the Environmental Protection Agency and recycled loan repayments from previous PENNVEST funding awards. Funds for these projects are disbursed after expenses for work are paid and receipts are submitted to PENNVEST for review. • New Sewickley Township Municipal Authority – A $717,653 loan to replace 5,200 feet of aging asbestos cement distribution water mains with ductile iron pipe. The project will address related health concerns, unreliable service, and improve water quality. • Bedford Borough Municipal Authority*– A $3,880,000 loan to replace 18,450 feet of antiquated asbestos cement and cast-iron water lines with polyvinyl chloride pipe. Fire hydrants and service lines reconnecting customers will also be added or replaced as necessary. The project will address unaccounted for water loss and improve service reliability. • Williamsburg Municipal Authority*– A $4,384,420 loan to install a new well pump, construct a new disinfection system/building, install two new packaged water booster pump stations, replace 7,300 feet of asbestos cement waterline, and install 3,700 feet of new waterline along Ridge Road to connect new customers. The project will provide for adequate disinfection, reduce high unaccounted for water loss, increase service reliability, and provide service to an area that is using private wells with insufficient yields during drier months. • East Stroudsburg Borough – A $2,416,000 loan to replace the existing raw water supply intake and transmission pipeline. The project is being undertaken in conjunction with rehabilitation work on the Middle Dam water supply reservoir and is replacing the existing transmission line that is over 100 years old and at the end of its useful life. • Easton Suburban Water Authority*– A $7,617,500 loan to construct a new 3.74 million gallon per day pumping station, install 2,600 feet of suction main, 6,900 feet of discharge main, and 7,600 feet of water main. The project includes nine new fire hydrants, and up to 75 service connection replacements. Fire flows, service reliability/efficiency, and water pressure will be improved with the implementation. • Bedford Borough Municipal Authority** – A $3,132,121 loan and a grant of $2,427,879 to install 29,900 feet of vitrified clay sanitary sewer pipe with new polyvinyl chloride pipe. The project will reduce inflow and infiltration due to wet weather conditions and raw sewage discharges into the Juniata River, and satisfy a consent order and agreement with the Department of Environmental Protection. • East Carroll Township** – A $342,429 loan and a grant of $1,176,571 to construct a wastewater collection system to serve customers near the Village of Reilly’s. The project includes 13,000 feet of gravity sewer main and appurtenances and will address a documented 87 percent on lot system failure rate allowing untreated wastewater in publicly accessible areas. Sewage will be conveyed to the Patton Municipal Authority for treatment. • City of Johnstown – A $5,200,000 grant to install 4,500 feet of sanitary sewer lateral piping and 2,465 feet of pipe to connect to the Johnstown Redevelopment Authority interceptor system. The project will reduce wet weather overflows of raw sewage into Little Conemaugh River and help satisfy the Consent Order and Agreement with the Department of Environmental Protection. • Johnstown Redevelopment Authority – A $11,125,000 loan to install 6,400 feet of gravity sewer, 275 feet of sewer installed by boring; 1,750 feet of sewer line rehabilitation and 6,000 feet of interceptor sewers to be cleaned in order continue to accept flows from Lower Yoder Township, Westmont Borough, and the City of Johnstown. The project will reduce wet weather overflows of raw sewage into Little Conemaugh River and help satisfy the Consent Order and Agreement with the Department of Environmental Protection. • Middle Taylor Township Sewer Authority – A $997,231 loan and a $2,622,769 grant to construct 27,000 feet of gravity wastewater sewers to an area currently served by wildcat sewers and malfunctioning on-lot systems at a rate of 54 percent. Sewage will be conveyed to the Johnstown Redevelopment Authority for treatment. • North East Borough Sewer Authority – A $12,618,000 loan to construct a pump station and force main to convey treated effluent from the North East Site 2 wastewater treatment plant offshore into Lake Erie. Upgrades to the chlorination disinfection system, grease/oil removal system, replacement of a failing clarifier, and a backup generator will be included. The project will address operational issues and effluent violations. • Greenfield Township Sewer Authority – A $2,000,000 loan to install a new influent screen, fine bubble aeration system, automated dissolved oxygen control system, new ultraviolet light disinfection control panel, and improvements to the chlorine contact tank. The project will improve operations and aid in the maintenance of the treatment facilities, and water quality of the receiving streams. • Union Township Municipal Authority – A $2,500,000 loan to install a new aerobic digester, a new raw pump station, replace two aeration blowers, improve the aerobic digester tank, and replace the reed beds. The project will address operational issues and bring the treatment plant into compliance with permit standards, ensuring proper treatment prior to discharge to the Kishacoquillas Creek, a tributary to the Juniata River. • Bethel Park – A $1,367,000 loan to install underground detention tank, rain gardens, reconstruct a flow splitting structure and expand retention ponds. The project will address the hazards associated with inadequate control of storm water flows causing flooding in residential areas and runoff of pollutants into the nearby unnamed tributary to Greaser’s Run. • Penn Township – A $1,454,866 loan to construct a detention pond, drainage swells various inlets and piping, and replace three culverts with associated piping. The project will eliminate periodic flooding in residential areas and reduce sediment into Bushy Run. • Delta Borough Municipal Authority – A $650,000 loan to install 5,282 feet of pipe, 66 new inlets, 10 new headwalls and 295 feet of swales. The project will alleviate issues with deteriorated and collapsing storm sewer pipes causing flooding on private property and runoff into streams. • Chester County Conservation District – A $420,625 grant to pay for a manure storage facility, manure reception pit, concrete cattle lot, reinforced gravel animal walkways, fencing, swales, roof gutters, and downspouts on the Michael King farm located in Bart Township Lancaster County. The project is expected to eliminate over 4,081 pounds of nitrogen, 1,854 pounds of phosphorus and 5,020 pounds of sediment from the West Branch of the Octoraro Creek, a High Quality Cold Water Fishery. • Lancaster County Conservation District – A $736,000 grant to cover the costs related to construction of manure storage facilities, waste transfer system, roofed stacking structure, heavy use areas, walkways, fencing infiltration bed, and storm water controls on the Elmer K. King farm located in Paradise Township, Lancaster County. The project is expected to eliminate 6,727 pounds of nitrogen, 2,926 pounds of phosphorus, and 4,800 pounds of sediment from entering Pequea Creek, an agriculturally impaired stream and is a Warm Water Fishery. • Tioga County Conservation District – A $783,044 grant to construct a liquid and dry waste storage and collection systems, covered heavy use area, animal fencing, critical planning and vegetation restoration, vegetative buffer, improved access roads, storm water drainage, diversion swales, and structural storm water controls on the Metzler Dairy farm in Shippen Township, Tioga County. The project is estimated to eliminate 17,470 pounds of nitrogen, 5,329 pounds of phosphorus and 2,680 pounds of sediment from West Branch of Stony Fork a tributary to Pine Creek. • Tioga County Conservation District – A $659,132 grant to construct a waste storage system, reception pit, waste transfer system, covered heavy use and feedlot areas, concrete feed pad, animal fencing, critical planting/vegetated treatment, improved access road, storm water drainage swales, gutters, and downspouts at the Slaymaker Dairy Farm in Sullivan Township, Tioga County. Project will address issues associated with a notice of violation issued by the Department of Environmental Protection and is estimated to eliminate 13,765 pounds of nitrogen, 4,469 pounds of phosphorus, and 2,140 pounds of sediment from entering Elk Creek. For more information, visit www.pennvest.pa.gov or call 717-783-6798.